At 3D Demolition, we’re committed to leading the industry in providing reliable, efficient and safe asbestos removal services in Brisbane, Toowoomba and the Sunshine Coast. Our services are comprehensive and affordable, with prices varying depending on the amount of asbestos to be removed. We can complete services as a standalone job or as part of your demolition project. Asbestos is an extremely dangerous material that should only be handled by certified experts like 3D Demolition. 3D Demolition is licenced to remove and dispose of all bonded Asbestos Containing Materials (ACM) prior to demolition. If required, material can be tested by an independent NATA-certified laboratory for confirmation of asbestos before work commences. During removal, the safety of both people and the environment are of utmost importance. Our asbestos removal team wears Personal Protective Equipment (PPE) throughout the removal process. All ACM are kept wet and unbroken before being double wrapped for disposal at an approved dumping site. A clearance certificate is issued for the removal area, prior to re-entry. There are two classifications of ACM—friable and non-friable (bonded). 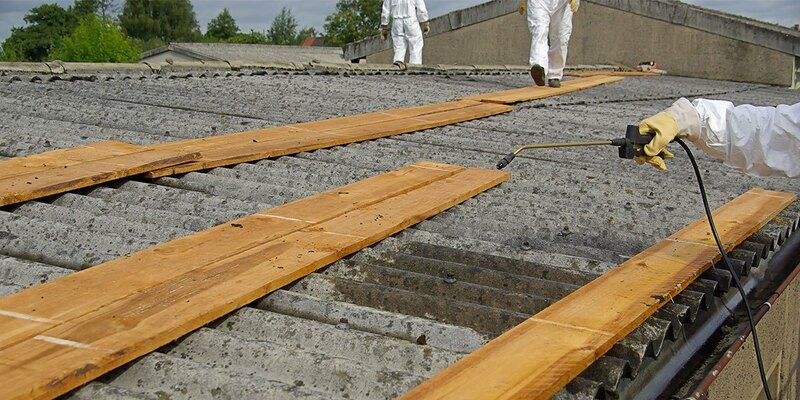 Non-friable asbestos contains asbestos fibres bonded with another material such as resin or cement. This type of asbestos can’t be crumbled into airborne particles. Friable ACM is any material that can be crumbled, pulverised or reduced to powder by hand pressure. The majority of buildings built before 1990 will contain some ACM. Asbestos can be found in wall and ceiling lining, roofing, fencing, tiling and piping. Get guaranteed safe and complete removal of asbestos at your site with the team at 3D Demolition.